Wood tortoise tables (tortoise enclosures) are usually the preferred way of providing indoor housing for tortoises. The only exception is Redfoot Tortoises that can be housed in waterproof housing made from plastics, glass or fibreglass providing that the tables are large enough. Essentially the Tortoise Table should have a large floor space. Typically UV lighting and heat lamps are suspended over the table. UV lighting and heat lamps can be purchased from Cosy Tortoises direct. Cosy Tortoises Tortoise Tables come in six standard sizes which are available as solid premium pine panel sides and a space saving two floor tortoise table. 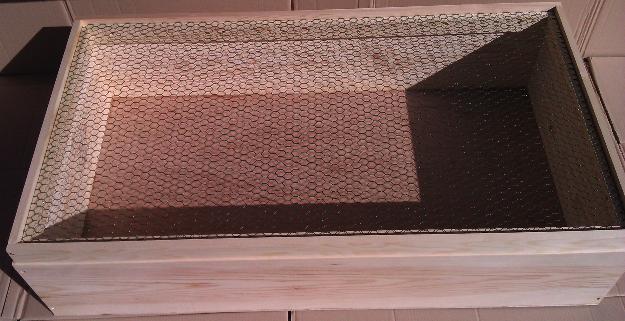 In addition we also sell mesh tops and side extensions for the security of your tortoises, other pets and children. If you would like to buy all of the accessories to go with these tortoise tables then maybe the "Ready to Go" setups range may be more useful to you. If none of the six standard range are suitable for you then you can choose your own size. Please visit the Custom Housing Quote Form for more details on how to inform us about your requirements. Please note that these Tortoise Tables are only suitable for indoor use only. Accessories and colour upgrade are available on this page for these Tortoise Tables. Pictured above are two pictures of a large tortoise table 2 m x 1 m with a custom hide door 35 cm x 35 cm and then a juvenile tortoise table. Cosy Tortoises Pine Tortoise Table is available in six sizes with or without Tortoise Hides. Mesh Tops are available for the Tortoise Tables. This provides protection for your tortoises from animals and young children as well as protecting them from heatlamp and UV electrics. Hasp and Staples as well as padlocks are available for these Mesh Tops. The Juvenile Tortoise Table comes with Mesh Side Extensions as an option to allow extra height for the heat lamp to sit under the mesh if necessary. We would not recommend suspending a heat lamp above the mesh top because the mesh is plastic coated. Free postage when ordering together with a Tortoise Table. Cosy Tortoises Hasp and Staples are constructed of stainless steel. They are used to secure the top of the mesh to the Tortoise Table with the addition of a padlock. Each top requires 2 Hasp and Staples to secure it, so for each Tortoise Table size these are the number required; Sub-adult 2, Medium 4, Large 4 and extra Large 8. Free postage with this item when buying with Tortoise Table. The Master Aluminium Padlocks are ideal for securing the mesh tops to the Tortoise Tables with hasp and staples. The padlocks are black with anti-scratch covering, aluminium body and a hardened steel shackle. Matching key head for easy identification. Each top requires 2 Padlocks to secure it, so for each Tortoise Table size these are the number required; Juvenile 2, Small 2, Sub-adult 2, Medium 4, Large 4 and extra Large 8. Free postage with this item. 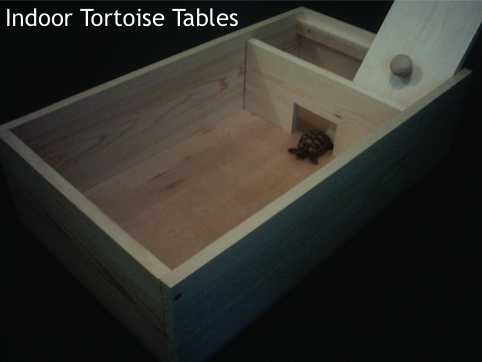 All of the Cosy Tortoises Tortoise Tables are a natural pine wood colour. However for an additional charge, you can upgrade to one of the 12 colours shown here. The paint has a wax enriched formula which protects against water damage. This also has UV filters which prevents greying and maintains the colour for longer. Please note the internal surface of the tortoise table will be not be painted. Only the outside of the four panels will be painted. When you order please send an e-mail to cosytortoises@btinternet.com stating which colour you have chosen for your tortoise table. Please click here to view colour chart.